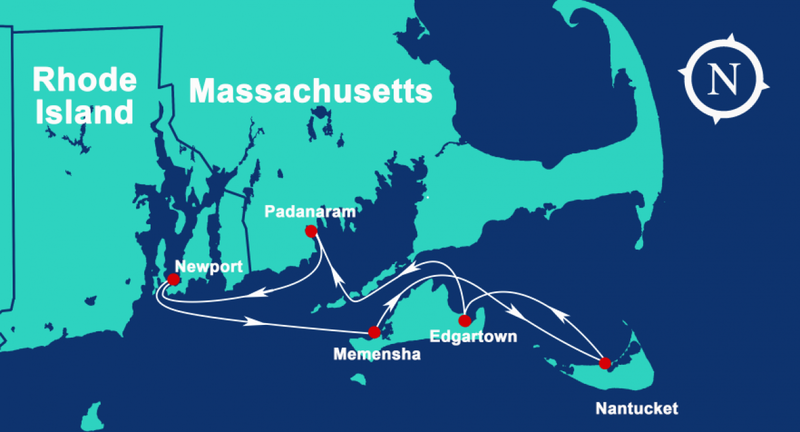 Plus de 400 miles de côtes, des vents constants et une longue tradition d'événements de voile de renommée mondiale, y compris l'America's Cup, qui a mérité à Newport son surnom de "Capitale mondiale de la voile". Newport sert également de passerelle de navigation vers les célèbres paradis estivaux de Cape Cod, Martha's Vineyard, Nantucket Island, les Hamptons et bien d'autres. Cet été, offrez-vous DES VACANCES MÉMORABLES À NEWPORT avec Navtours ! La région de Newport, dans le Rhode Island, nous offre des navigations et des ports mythiques, empreintes d'histoires fascinantes et de cultures maritime vibrantes qui continuent de prospérer de nos jours. L'approche de ces ports depuis la mer offre une perspective mémorable. Des villages de pêcheurs pittoresques et des îles éloignées aux villes sophistiquées chargées d'histoire, les itinéraires de navigation proposés par Navtours plairont à tout les goûts. Veuillez contacter notre agent de réservation Navtours pour discuter de votre itinéraire de location personnalisé en fonction de vos préférences et de votre expérience de navigation. Newport, Rhode Island, offers New England charm — with a little eccentricity. A contemporary city with a rich yachting heritage, Newport has something for almost everyone - from interesting shops and restaurants, museums, art and jazz festivals, to beautiful beaches, ideal sailing conditions, historic mansions, and the world famous "Cliff Walk". Built by early American rebels and defined by the ocean, Newport has one of the best coastlines in New England, which can you explore as you walk along the cliffside that towers over it. Find colonial architecture in the Newport Historic District and regal 19th- century mansions along Bellevue Avenue. Head to downtown Newport and explore Thames Street and Broadway, where there are countless shops, restaurants — you can find everything from seafood classics to Japanese ramen noodles — and a lively nightlife scene. Paddleboarding from Conanicut Marina in the neighboring town of Jamestown, surfing along Sachuest Beach and sailing the harbor are some of the best activities in the area. Catch the waves and gain a new perspective on the classic coast of New England. During the Gilded Age, many families summered in Newport. They left behind some of the most beautiful and best-preserved mansions in the U.S. Tour them to see what life was like for some here in the 19th century. Explore the manicured grounds, cliffside views and ornate decor of over 12 mansions lining Bellevue Avenue and scattered along Ocean Avenue. If it's peace and quiet you're after, Newport's 3.5-mile Cliff Walk is your ticket to escape. On one side, you'll have infinite views of the Atlantic Ocean and the sound of waves crashing against the rocks. On the other, you'll catch another glimpse of the Gilded Age mansions. It's the best of both worlds. Dining in Newport has many chef-owned restaurants, nationally acclaimed eateries, quintessential New England lobster shacks and budget-friendly hangouts. Eclectic home-goods shops and boutiques filled with unique styles and accessories line Newport's cobblestone streets and wharves. Spend a few hours meandering and collecting one-of-a-kind New England sundries — Thames Street and Bowen's Wharf are the best areas to start your shopping excursion. Jamestown Island is connected by two bridges to the shores of Narragansett Bay. Although it's a short hop to Newport, there's much to do on Jamestown Island. Try a round of golf on the 9- hole, 36 par course, outfitted with pro shop, bar & grill, and golf carts. Near the golf course, you can also find the Jamestown Island Sanctuary with hiking trails and wildlife viewing platforms overlooking the scenic salt marsh. You might also take a stroll down the quiet streets to view the beautiful homes tucked away among the trees. Otherwise, try Mackeral Cove Beach where life guards and beach facilities tend to your safety and comfort. If you're feeling more energetic head to Fort Wethergill State Park, where you can go sightseeing, rock climbing, fishing, picnicking, and scuba diving. Don't let the children miss the historic windmill on North Main Road, or the museum, playground and library that will keep them occupied for hours. 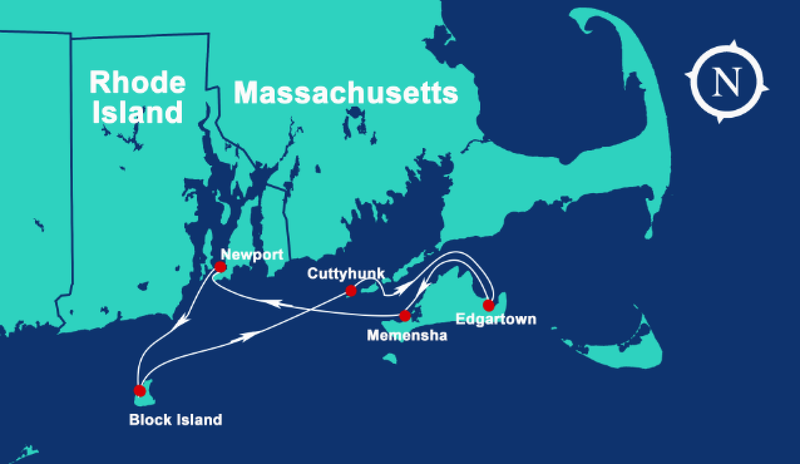 Cuttyhunk Island is the westernmost of Massachusetts' Elizabeth Islands, and part of a pretty string of islets between Buzzard's Bay and the Vineyard Sound. On Cuttyhunk, you can easily grasp the power of the Atlantic, and feel way the wind beats against the waves, how the sun glitters off the water's surface. Cuttyhunk, the south western most part of the Elizabeth Islands, feels like the remote corner of Massachusetts that it is. The harbor in Cuttyhunk Pond is protected by sandbars that make for amazing beaches. This destination dates back to the 17th century as a big game fishing mecca, but it's now equally attractive for sailors and weekend cruisers. Although the harbor can, at times, be crowded, the island is really known as a quiet, beautiful, and isolated spot to do some serious relaxation. You certainly won't want to miss this quaint and charming port of call. The quaint charm and elegance of Padanaram can be seen in the grand homes that look out over the harbor, as well as the quiet streets and the salty waterfront. But there's one thing that sets Padanaram apart from many other destinations - you won't find it listed on any chart. The charts say Apponagansett Bay is in the town of South Dartmouth, but everyone knows it's really the historic village of Padanaram. Padanaram is a natural beauty. You can spend time meandering the streets of the picturesque village. The beautiful island of Martha's Vineyard is a world apart, offering a vacation ambiance unlike any other. 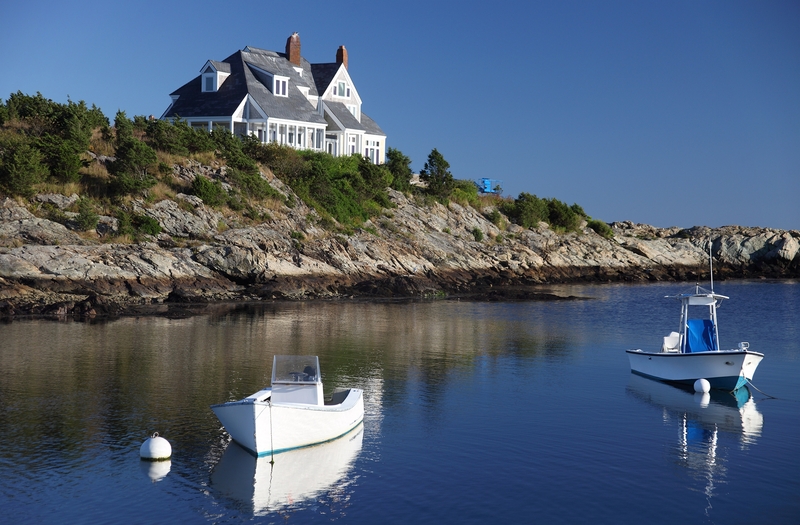 The seaside villages attract year-round visitors to their stunning beaches, gingerbread houses, bountiful recreational activities and unique New England Charm. The islands off Cape Cod are enchanting destinations. Martha's Vineyard, in particular, paints a vivid portrait. The chic, the super-rich, summer vacation homes for presidents, Black Dog, a bridge on Chappaquiddick, film crews and Jaws, all portray a very alluring destination. 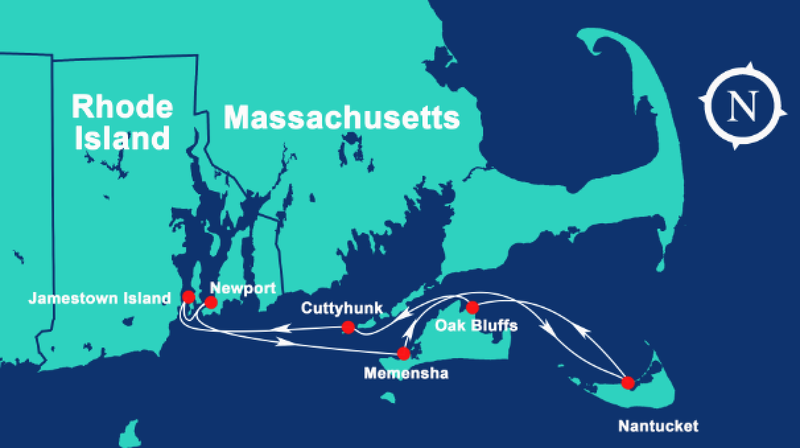 Just a short sail from the mainland, the Vineyard features pristine sandy beaches, natural beauty, golf courses, bike trails, nature preserves, lots of history, and more than a standard share of sun & fun-seeking celebrities. Getting there: The recommended approach to the Vineyard is via Quick's Hole from Buzzards Bay. Of course, passing around Cuttyhunk on a lovely day provides a great view of Gay Head from sea level. 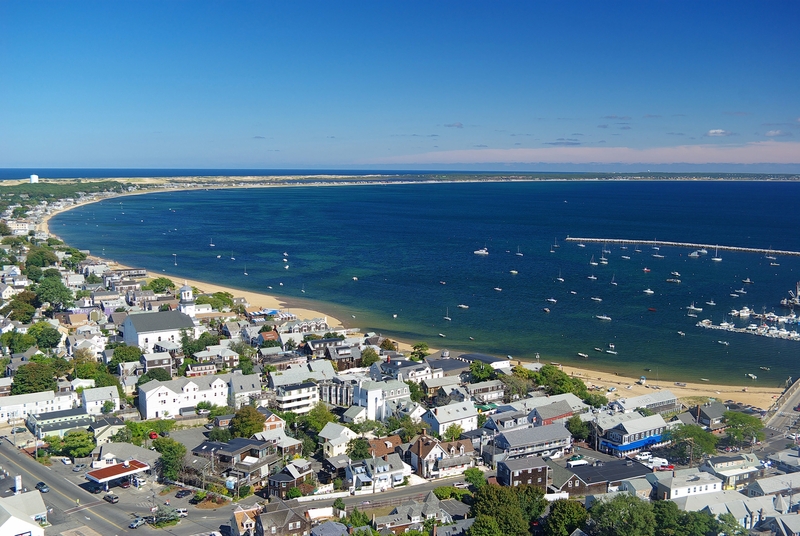 Vineyard Haven - is large and accessible and perfectly fine if you need to stop. The town is dry (no alcohol) but lots of fun and a few nice low-key restaurants (the famous Black Dog) and quaint stores. More powerboat oriented with a hugely supportive community marina, in a charming Victorian setting. 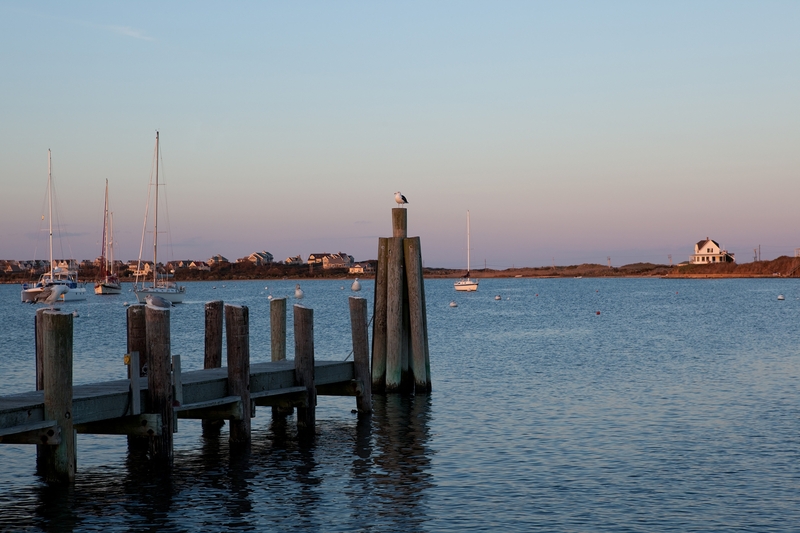 The quintessential and charming New England fishing village. 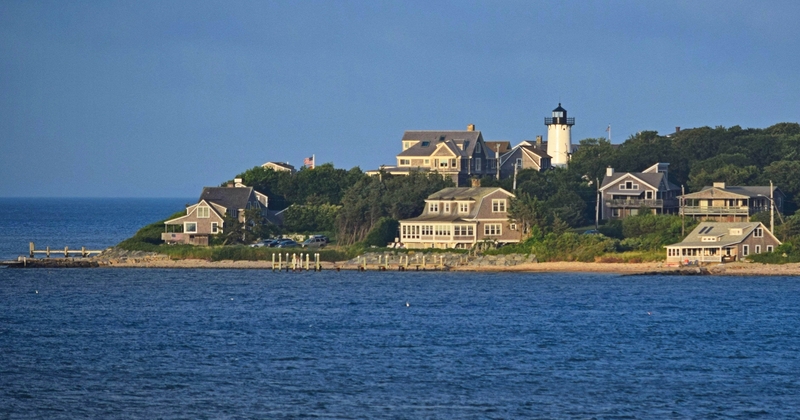 Nantucket is one of the most unique, and visually stunning places in the world. 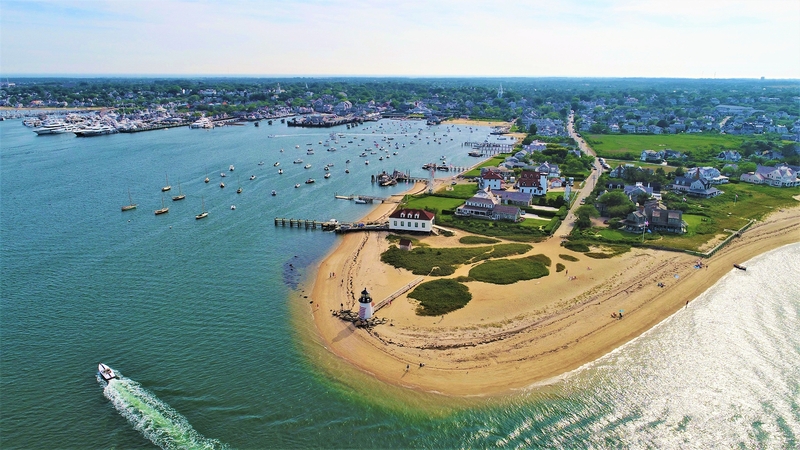 Originally a booming whaling port, Nantucket has been named a national historic district and little has changed architecturally since the 17th century, with seaside cottages and old-fashioned lamps still lining the streets. Nantucket lies 22 miles south of Cape Cod. There are numerous shoals enroute so it pays to have accurate charts and to follow the government marks carefully. The area also experiences frequent fog so be prepared. Because the approaches are relatively shallow, the waters can get churned up for a fairly rocky ride. Once you get there the anchorage can be crowded so do make reservations for moorings or slips well in advance of your planned trip. Known for excellent cycling, hiking, sailing, fishing, surfing, and beaches, Block Island was named by the Nature Conservancy as one of the twelves sites on the list of the "Last Great Places" in the western hemisphere. Approximately 20 percent of the island is set aside for conservation. Visit the Mohegan Bluffs, just walking distance from the Southeast Lighthouse. A long staircase of over one hundred steps leads to the bottom of these clay cliffs and looks out over the Atlantic. A visit to Block Island is not complete without a stop for a bowl of New England Clam Chowder at the National Hotel. 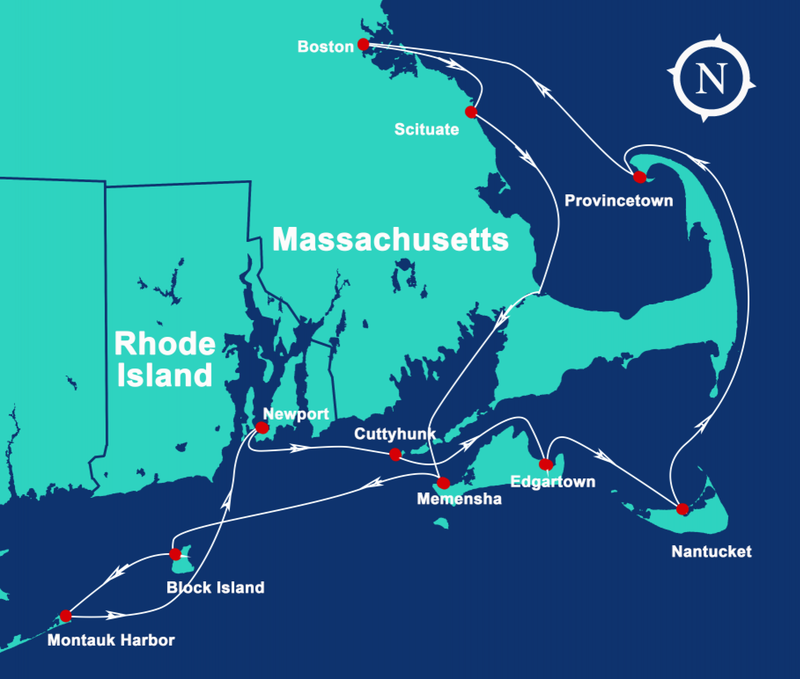 Block Island is one of the premier yachting destinations in New England. Block Island is rustic with lots of Victorian charm and natural beauty. Often called the Bermuda of the North, Block Island is laid back with several main venues that are well connected by good roads and easy to traverse by bike, car or taxi. It has two fine harbors. New Harbor (aka Great Salt Pond), and Old Harbor, where the center of town resides. New Harbor is about a 3 minute taxi ride, and easy bike ride, or 15 minute walk into town. Located at the end of Long Island's South Fork, Montauk, New York, has transformed itself from a small fishing town into one of the most desirable, scenic and lively towns in the North Eastern United States. Made up of just 19.8 square miles of land, there are numerous waterfront attractions that are easily accessed by boat, and marinas equipped to cater to visiting superyachts, making Montauk especially unique as a world- class cruising destination. Whether you are a sailor, a yachtsman or a tournament fisherman, Montauk provides the perfect setting to live life at your own pace, plus, if you wish to venture beyond, it's the perfect launching point to the nearby waterfront towns of the Hamptons. Overall, the summertime weather in the Hamptons is exceptional, making it a major reason why so many visitors venture out from New York, but many people enjoy visiting Montauk aboard a superyacht during the shoulder months of April or October when average temperatures are slightly cooler, allowing them to avoid the crowds and to take advantage of some great shopping and lodging discounts. Beyond Montauk, visitors will find an array of activities and cruising destinations to keep them entertained for a longer visit. Travelling from the marinas and anchorages of Montauk by tender or road vehicle, guests can explore the scenic roads of the Hamptons. Because of its deep and protected harbor, Greenport became a major whaling port between 1795 and 1859 and enjoyed a bustling shipbuilding industry as well. By the mid 1800s, the menhaden fishing industry was in full swing and employed thousands of people. The Long Island Railroad arrived in 1844 and was a driving force in the development of Greenport and the North Fork as local farmers used the railroad to ship their harvest to markets. Greenport became a huge oystering center during the first half of the 20th century and at one time there were over a dozen oyster processing plants in town. As the oyster industry began to shrink, the Village turned its attention towards tourism and has developed into a vibrant destination for visitors from all over the world. 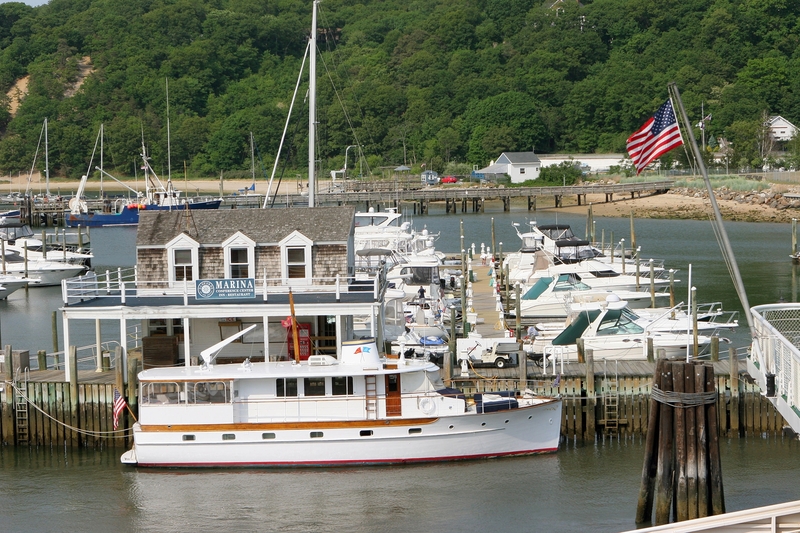 In 2011, Forbes magazine named Greenport one of the prettiest towns in the United States and in 2012, Yachting Magazine voted Greenport one of the 50 best yachting destinations in North America. Sag Harbor offers pristine beaches, breathtaking ocean views, historic homes, antique shops, hideaway inns and gourmet eateries in a truly unique setting of century old streets. Lunch or dinner at Sunset Beach Hotel and restaurant feels more like St. Tropez than Eastern Long Island, making Sag Harbor an excellent place to start your New England cruising. The villages and hamlets, which make up the Hamptons to east of New York's Long Island provide the perfect style and finesse for a luxury yacht charter getaway. Quaint boutiques, antique shops, art galleries and gourmet restaurants abound. Choose from chic, celebrity-filled Southampton, beach perfect East Hampton and laid-back Westhampton. Three Mile Harbor is conveniently located between Sag Harbor and Amaganset. This This beautiful Harbor is East Hampton's most popular port with access to Marinas, Anchorages, Restaurants, Groceries and more. You will find the harbor is well protected and offers a beautiful natural anchorage. The harbor is extremely long and very shallow along the west side of the channel. Fishers Island is located at 41°15'43" North, 72°0'26" West. 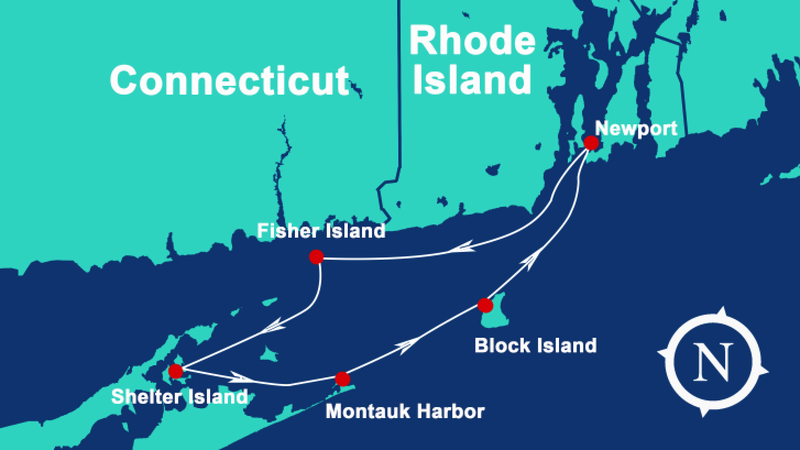 The Island lies just off the mainland of Connecticut and Rhode Island, about six miles north of Montauk across Block Island Sound from Long Island and Block Island. It forms the gateways to the Connecticut shore and Long Island Sound. Fishers Island is an amazing place unlike any other. If you are looking for a quiet anchorage for the night and some lovely beaches, perhaps to have a bonfire on (you'll need a permit), this is the place to visit. It has beauty, elegance and class but, if you know no one there or have no reason of going to the island, don't expect lots of friendly services, shops, and restaurants, because they don't exist. All in all, you will enjoy it if you just keep to yourself. The western half of the island offers some interesting biking and walking destinations. The beaches are beautiful. They are on the Atlantic Ocean just at the mouth of Long Island Sound, so there can be substantial surf. The other half of the island is very "real"; small cottages by the sea, fishermen and oyster farmers, a small school and library. Yet, it is unreal that such a life is still possible within a stone's throw of some of the most populated areas of the country. The Indians called Shelter Island "Manhansack-aha-quashawomock", which meant "an island sheltered by islands". And that is exactly what makes this island so special. Shelter Island (or "The Rock" as it is commonly called) is nestled between the twin forks of Long Island, protecting it from the swells of the ocean. Shelter Island was first settled by the Manhassett Indians and then later by the English in 1652. Today sailors and boaters, alike continue to enjoy these beautiful waters. We highly recommended a sail or cruise around Shelter Island. While circling the island you will see not only all the beautiful sights Shelter Island has to offer, but also to gorgeous scenery of the North and South Forks. Port Jefferson is a great destination from anywhere on Long Island Sound, lying directly across from Stratford Shoal Lighthouse. Moreover, it's a great stopover to or from more easterly destinations. Boating by the Manhattan skyline should be on everyone's bucket list. Seeing the city from this perspective isn't something you'll forget. This is an exciting city to visit and offers an enormous number and variety of berthing options. They range from quiet anchorages behind Sandy Hook on the southern side of New York Harbor entrance (although the river has strong currents so there are few options for anchoring), through busy docks at Staten Island, Brooklyn, in the Hudson and East Rivers, to quaint havens in the Bronx and other harbors at the southern end of Long Island Sound. Home to a National Park comprised of 34 islands and peninsulas. This is probably the best thing about boating in Boston. All but three islands are open to the public and many are only reachable by private boat. Many of the islands, such as Lovell, Peddocks and Grape, are great for overnight camping. You can drop anchor, find a secluded beach, and spend the day far from the traffic and crowds. 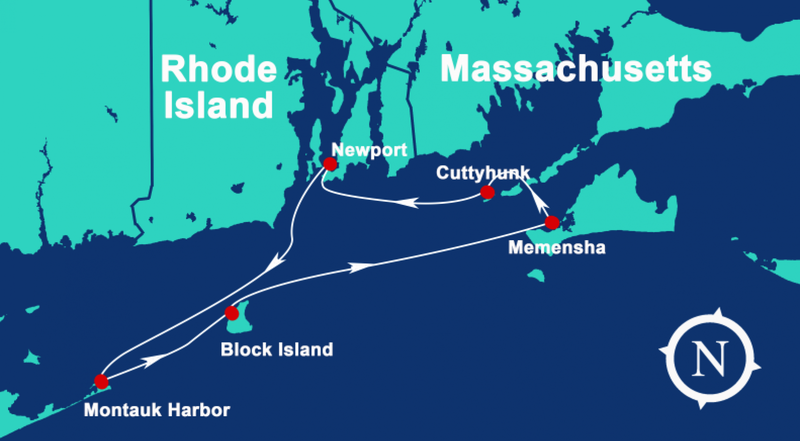 Stop off at Bumkin Island to see the historic ruins or sail past Fort Warren on Georges Island, or visit Boston Harbor Light, the oldest lighthouse in the US. Not to mention the Harbor Islands are a premiere spot for sport fishing. Anglers here catch Stripers, Cod, Bluefish, and Flounder. Boston is home to the Boston Harbor, an important port in any American history book because it was the location of the Boston Tea Party in the 17th century. Today, while much of the history of the Boston Harbor is still intact, so are many other amenities that tourists from around the country seek to find in Beantown and hitting the water on Boston boat rentals is a visitor's dream. The Gerry E. Studds Stellwagen Bank National Marine Sanctuary is part of the Massachusetts Bay and a prime location for whale watching. It is common to see humpback, fin, minke, northern right and pilot whale, as well as Atlantic white-sided dolphin. Spring and summer are the best times for whale watching. Take your boat out to the bank and keep your fingers crossed for a "whale show." Perched way out on the edge of Cape Cod, this friendly and relaxed seaside town also happens to be home to the country's oldest art colony. As part of the Cape Cod National Seashore, it has miles of gorgeous beaches for you to explore on foot or by boat. Get out into province lands for miles of scenic hiking and bicycling routes through majestic dunes and rugged wilderness, as well as for the stunning view both out over the Atlantic and in towards Boston and the rest of the Cape. Join locals and tourists alike in walking around the cute streets, stopping in designer boutiques, locals s shops, friendly cafés, and acclaimed restaurants. Check the calendar before you come, as there are always festivals going on in Provincetown. The unmistakable fist of sand that the Pilgrims encountered at the end of Cape Cod still forms a winding entrance to the harbor, offering greater protection around every turn. At the center, is the Pilgrim Monument, 348 feet above high tide and visible over twenty miles away. A series of bearings on the monument is a reliable way to measure your progress against the coastline's succession of near-identical dunes and beaches. Comment recevoir une proposition de prix et réserver ? Pour plus de détails, veuillez contacter l'un de nos spécialistes de la planification au 855-382-4445 ou envoyer un email à notre équipe à l'adresse navtours@navtours.com. Un acompte de 30% garantira votre réservation. Nous acceptons les espèces, les chèques, Mastercard, Visa ou virement bancaire. Le solde est dû 30 jours avant la date d'embarquement. Quelle expérience de navigation est requise? En règle générale, la personne qui conduit le bateau doit avoir une expérience de la conduite d'un bateau de taille, de déplacement et de gréement similaires, et une expérience de navigation comparable à l'itinéraire prévu. Dans le cadre du processus de réservation, nous discutons de votre expérience. Le capitaine et l'équipage sont-ils disponibles? Si vous préférez engager un skipper ou un équipage, nous vous proposerons une liste de professionnels de la voile qualifiés et expérimentés. De nombreuses personnes profitent de la sécurité de la présence d'un capitaine à bord pendant les premières heures, ce qui leur permet de se familiariser avec les bateau loué, ou encore de recevoir une instruction de voile tout en découvrant un nouveau plan d'eau. Quels coûts supplémentaires dois-je m'attendre? Les dépenses supplémentaires comprennent les frais de nettoyage et de literie, le rachat de franchise, la taxe de vente, le carburant, les vidanges, le ravitaillement, ainsi qu'un dépôt de garantie remboursable de 1 000 $ ou 1 500 $ selon la taille du bateau loué. Vous pouvez également choisir dans notre liste d'inventaire / services supplémentaires. Où se trouve la base de Navtours à Newport? Notre bureau et notre flotte sont situés au centre-ville de Newport. Nous sommes juste à côté de Ann Street Pier et du centre maritime de la ville de Newport, sur Thames Street, au cœur du village maritime. Il y a un parking de nuit à proximité, un bain public et tous les plaisirs que Newport a à offrir pendant la période estivale. Adresse: 3 Christies Landing, Newport, RI.